One of the biggest dilemmas vegans face is what to do with their non-vegan belongings. Some people are adamant you should not continue to use or wear any non-vegan items you bought before going vegan or anything you may be gifted after. Vegans who care as much as the environment as they do animal rights may argue to discard these items would be wasteful. Non-vegans would point out it’s hypocritical to continue using things that are made from animals. To have more nuanced discussions about veganism, we have to be open to the idea that not all vegans are going to agree on what the right thing to do is in these instances. There are plenty of grey areas within veganism and how to deal with non-vegan items is one of them. There are a few non-vegan items I still own, even after a decade of being vegan: a pearl jewellery set, a tote with leather straps, a wool scarf. I’ve acquired these items through various means: gifts from well-meaning family members, second hand purchases because options were limited, unexpected PR gifts, and mistakes from when I forgot to check the label. Am I comfortable owning and using non-vegan items? Not particularly. Can I afford or justify giving them away and replacing them? Not really. And what are your options when dealing with non-vegan items you might already own? Parting with non-vegan items is easy when it’s things we do not need. It’s not quite so easy when it’s a pair of shoes we wear daily, a warm coat for the winter, and the only bag we own. Therein lies the problem with replacing these non-vegan items: it’s costly and often wasteful. As a minimalist vegan, I’ve certainly struggled with what to do with certain items because everything I own, I use; giving them up would require me to spend money on new purchases and, as a result, cause waste. There’s no definitive solution. You have to make up your own mind about the best way for you to deal with any non-vegan items you may own or be gifted, before and after going vegan. These are the 3 main ways you can deal with your non-vegan items, and the pros and cons of choosing them. We throw away 3000,000 tonnes of clothing every year in the UK alone. We waste a lot of clothes and giving yours away sometimes adds to that waste. The best option would be to find a new home for your non-vegan items with friends and family members or someone who will use them instead of dropping them off at the local charity shop. However, that implies you believe it’s OK for others to use animals and it’s simply a matter of personal choice that you don’t. Donating your items will most likely leave you needing to replace quite a few things, can you afford to do that? Would it be wasteful? Selling your non-vegan items might seem like a good way to recoup some of the money you’ve lost, which you can then use to spend on vegan-friendly replacements. The trouble is, selling these items is incredibly problematic. Do you want to profit from the sales of animal products? Do you want others to wear them? Selling these items will undoubtedly drive demand for these types of products. By selling your leather shoes, woollen knitwear, and down coats, you’re encouraging others to buy them. A solution might be to use the sales of your non-vegan items to raise money and awareness for an animal sanctuary or charity, and donate any money you make to their cause. Toiletries and beauty products are easy to use up. Clothing and accessories, not so much. A pair of leather shoes can last years, sometimes decades, especially if you only wear them occasionally. 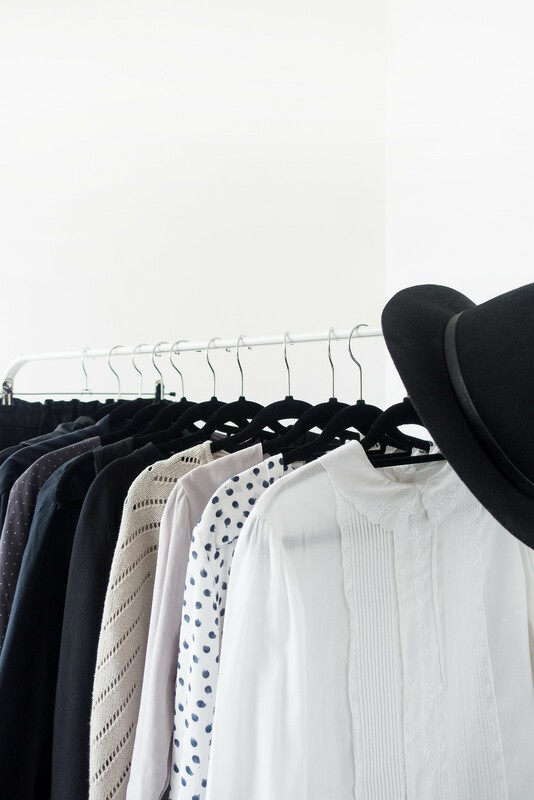 Continuing to wear non-vegan items, especially clothing, might be considered ethically inconsistent to other vegans and hypocritical to non-vegans. From an environmental perspective, using things up is the best option. The money has already been spent and giving away or selling these items only encourages others to continue buying them; using non-vegan items up and then replacing them minimises that waste. However, many people find it distressing to continue wearing or using animal products even if it is more environmentally-friendly. 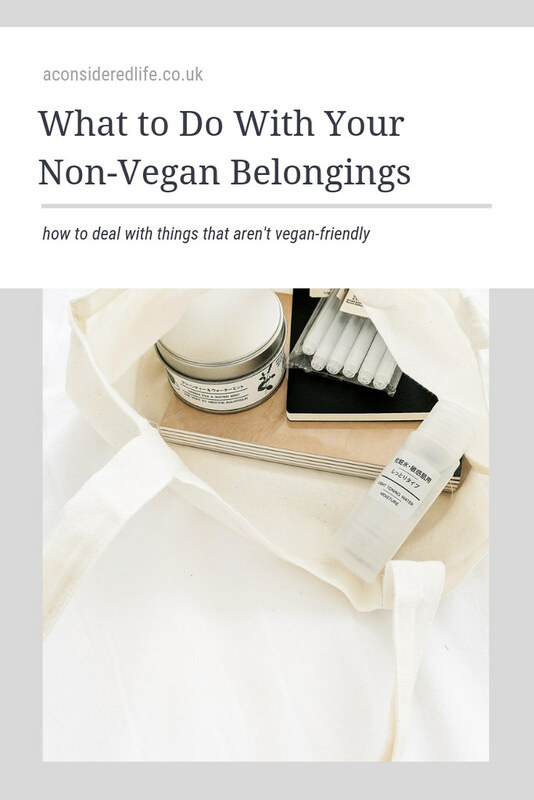 Everyone has different feelings and ways of dealing with their non-vegan belongings. My solution? There isn’t one single solution that I’m entirely comfortable with; I fall somewhere in between using things until they wear out and donating items to charity shops and animal shelters. However you choose to deal with your non-vegan items, do not throw things away. The damage of buying, owning, wearing, and using non-vegan items has already been done, and throwing them away won’t resolve you of that ethical burden. There are many people in need who could make use of your unwanted things and who do not have the privilege of having an ethical preference. Remember to talk to family, friends, and even colleagues, and explain why you would like them to be mindful when buying gifts in the future. Just know that, whatever you choose to do, you’re doing your best. Veganism is about intention not perfection. You’re already creating a positive change by making the commitment to make more compassionate choices in the future. How are you dealing with your non-vegan items?